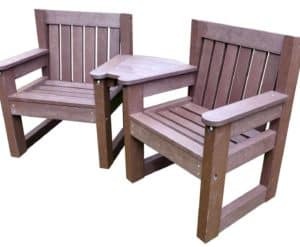 Two attractive carver style chairs with an integral table, our tea for two is a great addition to any outdoor space. Available in two seat widths. Two attractive carver style chairs with an integral table, our tea for two is a great addition to any outdoor space. The central table is connected to the chairs so takes up less space than a separate table if you have a little corner that catches the sun. It is ideal for an afternoon tea, or cosy evening drink. This versatile and comfortable seat set will be an absolute winner. Outdoor seating has never been so easy. Manufactured from recycled plastic waste, that would have been destined of UK land fill, also means the Tea for Two is a good environmental choice. Equally at home in a private garden, or public park, the Tea for Two will provide a focal point and a welcome destination for a well earned feet up moment. Available in two colours and seat widths 660mm (small) and 740mm (large). The Tea for Two will require minimal assembly when delivered. Simply use the fixings provided to attach the table to the seats. We will even pre-drill the holes for you to simply put the screws in.